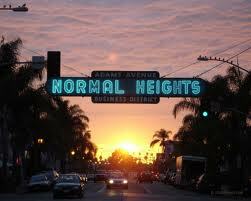 Normal Heights brings funkiness and artistic charm to San Diego’s diverse landscape. Situated between University Heights and City Heights to the East and West and Interstate 8 to the North and El Cajon Boulevard to the South. Home to the Adams Avenue Street Fair, Roots Festival, Art Around Adams and Antique Row, Normal Heights has a great deal to offer its residents. With many traditional bookstores it is also a literary haven for many book fanatics. With its housing stock of mostly craftsman homes, small condos and apartments, Normal Heights has a variety of housing options for many people. A diverse demographic calls this neighborhood home and a sizeable proportion of the residents regularly walk and ride their bike to and from their destinations. An urban melting pot, this neighborhood has a wonderful variety of ethnic foods, bars, coffee shops, live music venues and lounges to enjoy. You won’t find many chains here….this is a community of individually run businesses. Renewed and re-discovered, Normal Heights is a great example of just how diversity and quirkiness can make a community a truly wonderful place to live.